If you feel unsettled at the prospect of large groups of privileged people from the developed world spending vast sums of money and fossil fuel to listen to pep talks on climate change activism, then prepare to be dismayed. Creative ferment? An interesting way to describe the interior workings of a small and declining denomination that’s reinvented itself as an LGBTQ advocacy group with a sideline in aggressive litigation. But still, Schori isn’t above a “call to action,” green action, of course. She concludes by describing Saint Paul’s viridic power as evidenced in the Apostle’s Epistle to the Colossians. 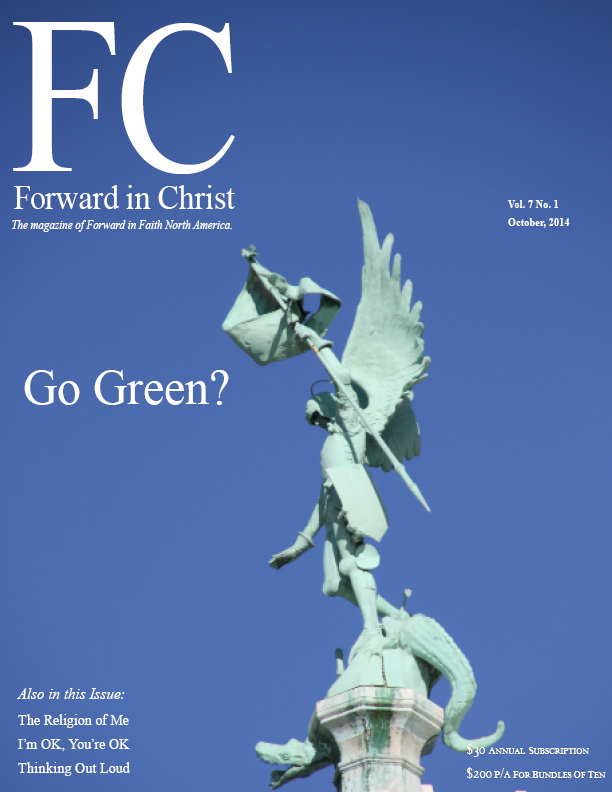 He’s part of the green movement too, along with Sirach, the Psalmist, St. John and Jesus himself. And there you have it. In the whole address the word “green” appears 13 times, almost rivaling the word “the.” The word “Christ” appears once, in an astonishing sentence equating him with the “green man” of pagan legend, and the word “salvation” appears not at all. We could perhaps be forgiven for wondering if the whole thing was written by a U.N. apparatchik, rather than a Christian. But that aside, there is an irony in the Presiding Bishop’s idea of what it means to expand the apostolic imagination. I hope, for her sake, that it’s unconscious. In the first place, urging some 100 comparatively privileged bishops to be green on the heels of who knows how much spent jet fuel, is at best ironic and at worst, bald-faced hypocrisy. All at the cost of $500,000. Climate change awareness doesn’t come cheap, it seems, and so much for the House of Bishops’ brave attempt to minimize their carbon footprint. This is bad enough but it gets worse. Schori’s new-found green virtue, viriditas, isn’t original with her and she freely admits it. It’s a word used by the famous 12th century “Sibyl of the Rhine,” Saint Hildegard von Bingen, who was a reforming Benedictine Abbess, scientist, musician, preacher and visionary, or prophet. This brings us to the point. Saint Hildegard, one of the few Doctors of the Church, no less, was fiercely anti-schismatic; as we’ve seen, a scourge of heretical Catharism and about as far removed from being an LGBTQ champion as you could hope to get. In short, she was a zealously orthodox catholic Christian of the 12th century, and while she was able to use feminine language to describe God, she could only do so because she was firmly grounded in his transcendent Fatherhood. We see something of this in Hildegard’s opposition to the ordination of women as priests. “Therefore,” she writes in Scivias, quoting God the Father, “just as the earth cannot plow itself, a woman must not be a priest and do the work of consecrating the Body and Blood of my Son; although she can sing the praise of her Creator, just as the earth can receive rain to water its fruits.” Take it or leave it, that’s Hildegard’s view on the matter and Schori is either unaware of this or conveniently ignores it. Hildegard’s words speak for themselves and I’ll leave you to consider the extent to which they apply to Katharine Jefferts Schori’s version of God’s church: a church which has come out of the church, and which wounds the Body of Christ by its violently continued schism, heresy and open immorality. That a quasi-Cathar, such as the Presiding Bishop, should have chosen such a Saint as the patron of her House of Bishops is irony indeed and perhaps apt. Hildegard stands as a prophetic voice to the heretics of her own time and to ours, a voice calling for repentance and a reminder of the implacable will of God. A will that guarantees Antichrist overthrown and the church beautiful and shining in the embrace of her Beloved. Herein lies true viriditas, or “greenness” if you like, the abundant, procreative, life-giving power of God in His Bride, the church.